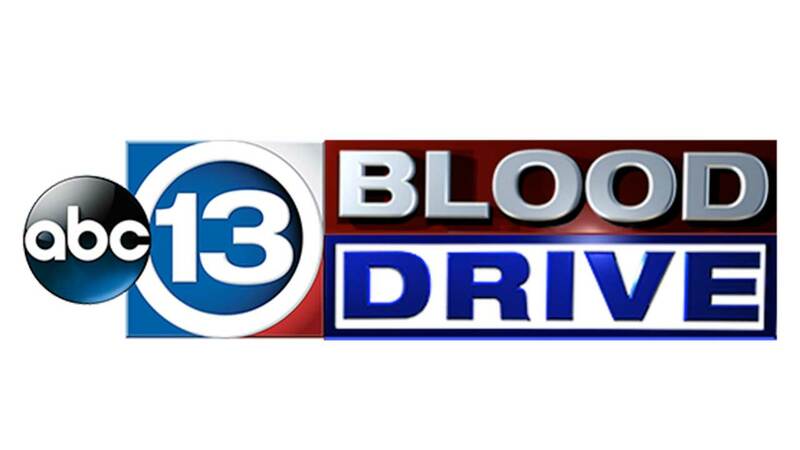 ABC-13 and the Gulf Coast Regional Blood Center are teaming up to help save lives across southeast Texas. Below are the times and locations we hope to see you! Friday, March 6 from 2:30pm to 7 p.m.
Saturday, March 7 from 2:30pm to 7pm. Below are just three stories of how your donation helped save lives. Audrina is a familiar face to ABC 13 viewers, as she underwent successful surgery at Texas Children's Hospital in the fall of 2013 after being born with a third of her heart outside her body. Audrina went through a second heart surgery in December 2014 and is doing well now. She no longer needs oxygen and can breathe on her own. Audrina's mom, Ashley, said she is willing to come out to the blood drive on March 6 at the station and bring Audrina with her. Ashley and her family members would also like to donate blood at that time. Dana George's son, Luke, was diagnosed with Leukemia in 2013 when he was only 5 years old. Luke was an average outgoing, happy and playful little boy until he came from kindergarten one day with a limp. They caught the cancer early and started treatment immediately. Luke underwent seven blood and platelet transfusions within a matter of six short months. Dana says she would not have Luke with her today if it wasn't for the selfless people who choose to donate blood and change someone's life. Dana was a blood donor in the past and would like to become a Commit For Life Donor. She would like to donate blood at the ABC-13 blood drive on March 6. Jennifer O'Loughlin received eight units of blood and five units of plasma after giving birth to her daughter. When she was only 12 weeks pregnant she found out she had a placenta previa and a placenta accreta. She would undergo a very difficult child birth that would require a four hour surgery, most likely a hysterectomy, and a blood transfusion. When she went into labor she had to have an emergency C-section and lost a large amount of blood. Jenni says that if it wasn't for the skilled team of doctors and the blood donations, she wouldn't be alive today. She wrote a very detailed and moving account of her journey for Texas Children's Hospital blog.